More news just in from Rory Trahair of Edmiston & Company as he tells me that Chris Cecil-Wright's central agency for sale, Feadship's 71.6m Utopia is, now priced in Euros rather than dollars. Currently en route from Genoa, she'll arrive in Monaco on September 22nd, just in time for viewing during the Monaco Yacht Show. 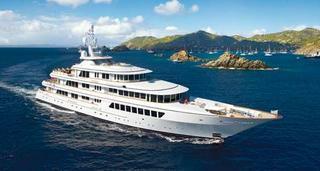 Sleeping 12 guests in an owner's suite, two VIPs and three doubles Utopia was on the market at $69 million. She's now asking €52.5 million.